Sweet and spicy chicken like something you'd find at your favorite Chinese take-out place. 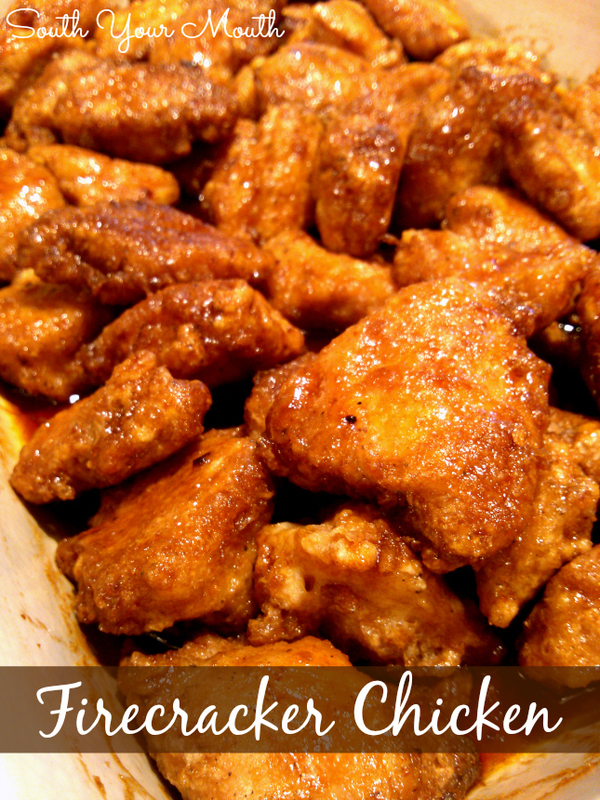 So I kept seeing these delicious looking recipes on Pinterest for “firecracker chicken”. Finally, after seeing about a dozen different photos, I decided to take a look to see what in the world it was. Two things caught my eye. The first was how you “bread” the chicken. You start with cornstarch which is nothing uncommon (it helps any coating stick and makes for an extra crispy coating) then you dip it in egg. That’s not uncommon either except that usually, after you dip it in egg you then dredge it in some flour-based mixture. But in the recipes I found, you didn't do this. You stopped with the egg. I thought that was pretty interesting and wanted to check it out. The second was that you finished the chicken and glaze in the oven. This appealed to me because while the chicken was in the oven, I’d be free to finish the rest of supper and clean up some (because frying is a messy undertaking). I’d already made my mind up to try it out and decided to make a big batch of it because if I’m frying something, I’m gonna get my money’s worth. I ain't stinking up my house and getting greasy for a few servings. You can easily reduce this recipe by half, have some guests over to help you eat it or, do what I did and take the leftovers to the young couple across the street. I've yet to find the original source for this recipe but the oldest I can find (and the one that most folks seem to have fashioned theirs after) is this recipe from Mel’s Kitchen. Beat eggs with 1/2 teaspoon salt then quickly dip cornstarch-coated chicken pieces in egg, shake off excess, then fry in hot oil on both sides until light golden brown. Cook in batches to ensure you don’t overcrowd the pan. Remove browned chicken pieces to a very large baking dish (or two 13x9 pans - you don't want to have more than two layers of chicken in the pan or it will get soggy); set aside. Once all chicken is browned, whisk together sauce ingredients until smooth. Pour sauce over chicken pieces then gently stir to coat. Bake, uncovered, at 325 degrees for 45 minutes, stirring once after 25 minutes. Serve with white rice and steamed vegetables if desired. Wonder how this would work as a "wings" recipe? Boneless, skinless chicken breast can be so dry and I really LOVE wings. And another gets bookmarked, thank you for sharing! Made this last night, as is. Followed directions to a T and it was so amazing! Seriously, my kids could not get enough. I know this recipe makes a lot but I was told next time I need to double it! I'm not one for hot or spicy foods but this is the perfect combo of heat and sweet. Served over a bed of rice, you can't go wrong! Thank you so much for this recipe! !